I actually took that photo in 2013. That’s part of the story. It actually doesn’t start there though. It’s starts on August 20th, 2011. The day I ran my first official race. 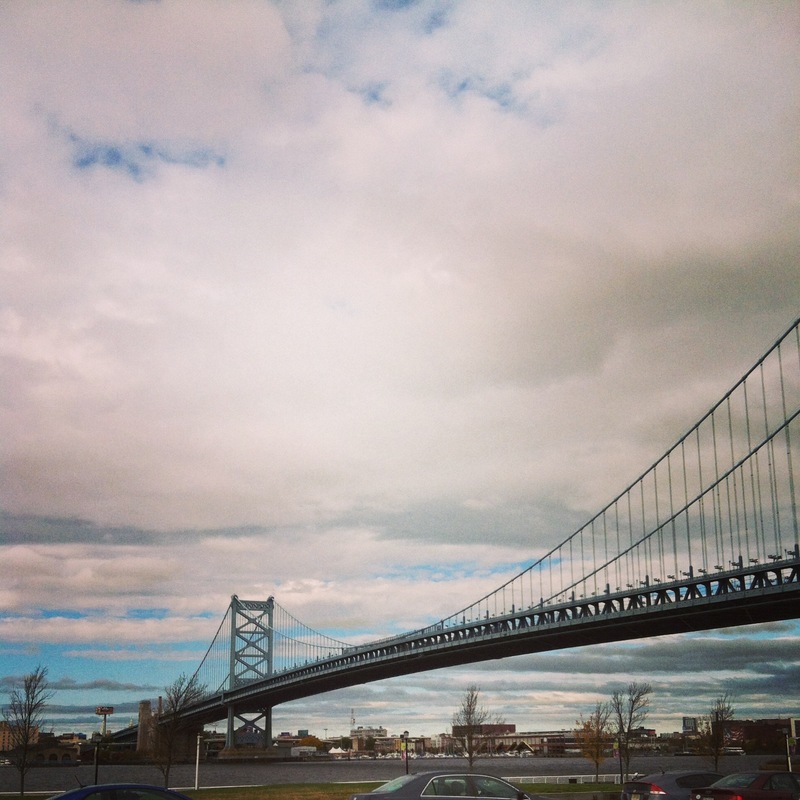 It was a 10k – the Philadelphia Livestrong Challenge. I remember it like it was yesterday. I woke up totally freaked out and almost didn’t go. I was going alone, and I had no idea what to expect. I also didn’t really run 6.2 miles all that much so the distance scared me, too. I went anyway. I totally had a panic attack in my car and cried on the way there (and it was a long drive). I got there, got my bib and just stood there and stared at it, with absolutely no clue what I was supposed to do with it. A random stranger approached me, and said, “You look like a newbie. Here’s some pins for your bib.” A wave of relief washed over me, taking my shame with it. I thanked him, and proceeded to attach what would wind up being the first of many, many racing bibs to the front of my shirt. I made my way to the start, but I still had this bag with the race shirt in it. “How come no one else seems to have this?” I wondered. I felt clueless again. So I did what any person running their first race alone would do – I ran holding the bag. I also wasn’t sure if running with headphones was a thing – so I left my headphones and ipod at home, only to discover that pretty much everyone else had headphones and an ipod. So I silently made my way through 6.2 very challenging and very hot miles, holding a bag with a shirt in it. But you know what else I did? I finished. It took me 1 hour and 2 minutes. I wasn’t doing it for time though, I was doing it because I wanted to finish. I wanted to prove to myself that I could run a 1ok. And prove it to myself, I did. I cried again on the way home, but this time with joy. And that, my friends, is how my love of running began. I have since run a lot of races, but I admit that only a handful of them have been a 10k. They just don’t seem quite as popular as some of the other distances. But the 10k has and will always have a special place in my heart. The Cooper Norcross Run the Bridge is one that I’ve done 4 times total, including today. In 2013, I had a PR (personal record – my mom asked me to define some of the terminology, so that’s for you, mom) at that race – the day I took that photo at the top. I ran it in 56:40 that day. Over 5 minutes faster than my first one. I also ran with a group of friends, including my boyfriend (who is now my husband). I had come a long way. I was grateful for the strength, dedication, and perseverance it took to get from race A to race B. I was grateful for the love and support of my running peeps. I was hurting though, and thought that would be my best 10k for a long time. If your definition of “long time” is 2 and half years, than I was correct. In April of 2015, I ran another 10k at the Riverwinds in Deptford – the “411 Race”, at which I ran a 56:04. I was honestly, surprised. I really didn’t think I could run a 10k any faster than my previous PR, but somehow, I managed to beat it by 36 seconds. I ran this with some friends, too. 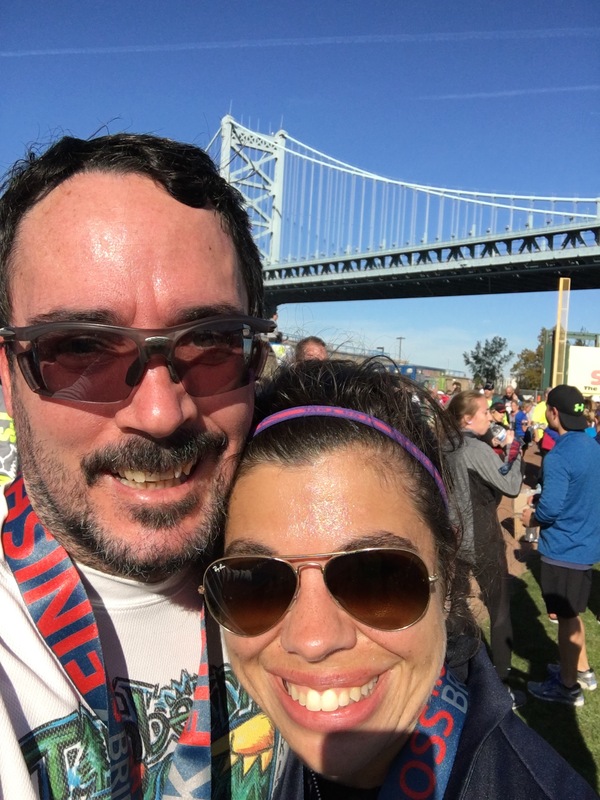 In fact, I don’t think I’ve run a single race alone since 2012.
my partner in running, and everything else. That picture was taken today. 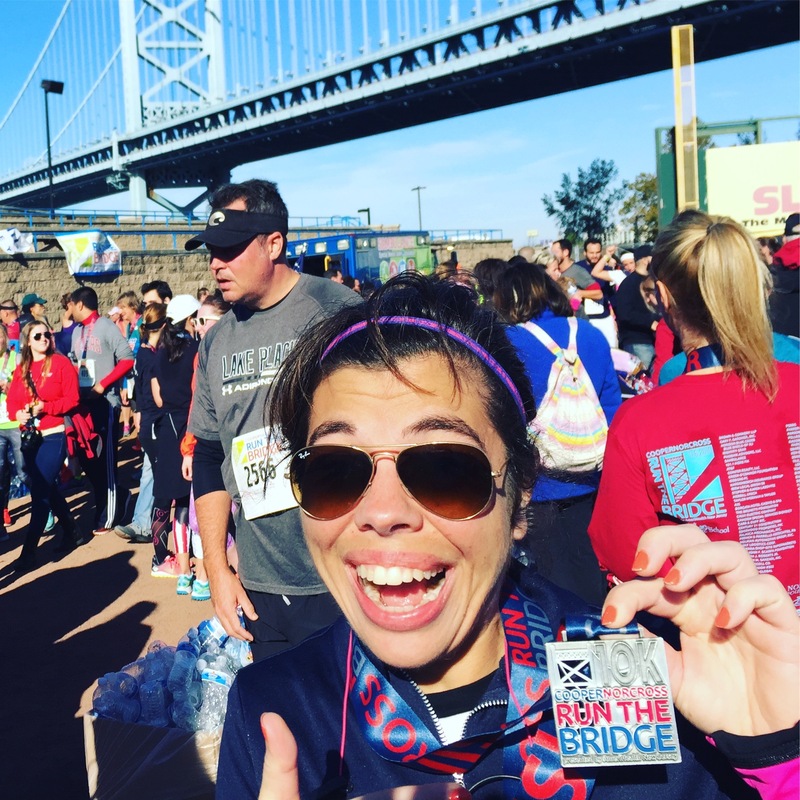 At the Run the Bridge, 2016. On the way there, I told my husband that I was going to PR today (I actually also told him I was going to win, but not all dreams come true). The weather was perfect. We found our friends. We had our bibs pinned on, and I had my headphones, ipod, garmin, fitbit and wrist wrap (to hold my keys and ID). As I made my way across the bridge, I thought about those races of days past. I remembered how hard they were. I remembered how long they felt. I remembered how amazing it was to complete each and every one. I was grateful for my ability to grow, and for everything I’ve learned and accomplished. I was grateful for my husband and my friends. I was grateful for running. I finished in 54:38. I did it. Good things come to those who work hard, stay strong, and believe they can do it. It’s never too late to start believing. ← It’s So Amazing Here. This blog is dedicated solely (get it?) to my passion for running, and the various and sundry incidents and accidents I encounter along my journey. So sit back, lace up, and enjoy! I then wondered if maybe it was a sign. Why did this bird land right in front of me while I was running? Was it a message from the Universe? In fact, I think running actually WAS creating. Why do I run? Because I can. I can run wherever and whenever I feel like it. I can run for as long as I want, as short as I want, as fast as I want or and slow as I want. I can run in the park, on the trail, at the gym, on my treadmill, or on the streets where I live. Running is never routine. That’s why I love it. Lucky for Them, I’m a Runner. As I ran my 9 miles through the park yesterday, I thought to myself, I will never take my runs or my rights for granted. Someone years ago worked hard to give me the freedom to choose how I want to live my life. If I Can Get Better, Why Not? If I can achieve my running goals, I can achieve my life goals. If I can stop comparing my running to other people’s running, I can stop comparing my life to other people’s lives. If I can run happy, I can live happy.